On Wednesday morning at Government House, Chamero Trias received two cheques; the first for $50,000 was handed over by the St. Vincent/Cuba Friendship Society represented by Renwick Rose. 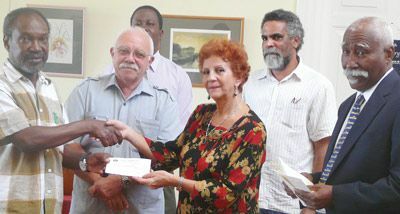 Rose indicated that more than 150 Vincentian individuals, organizations and business places contributed to the relief fund in a show of solidarity toward Cuba, which has been rendering assistance to St. Vincent and the Grenadines over the years. Rose took the opportunity to thank the persons who contributed to the fund and indicated that the appeal was ongoing. Cheque number two for $20,000 came from the Governor-General himself Sir Frederick Ballantyne on behalf of the Directors of the Caribbean Reference Laboratory. Sir Frederick noted that he was well aware of the contributions made to this country in the field of medicine by Cuba and it was only fitting that Vincentians help in time of need. Sir Frederick also made an appeal to Vincentians to continue to support the relief fund. On accepting the cheques, the Ambassador expressed heartfelt thanks for the gesture, saying that the sincerity of the act was most important. Chamero Trias said that the solidarity between this country and hers is strengthened by the donations. This year, Cuba was hit by more than three hurricanes costing billions of dollars in damage.